I've been a lazy blogger the past month or so. Seems like my writers blo ck coincided with our move to our new blogging location on RoseBizInc.com so hopefully this entry will get me back in the spirit. If I fail miserably to excite, inspire, inform or educate anyone who reads these blogs please don't tell me so. I'd rather live in a spirit of happy ignorance than to really hear your true opinion. This is not as obvious a question as it would seem. We see a surprising number of huge transaction logs in clients who should know better. This commonly happens when transaction logs are not being backed up regularly and the database is running in Full recovery mode. If the log grows large enough, SQL Server can stop working leading to a lot of excitement. Typically, this solved with a properly setup maintenance plan in SQL Server but what if that's not the case? What if the maintenance plan is failing and not providing notifications? Short of regularly monitoring transaction log growth, how can a DBA ensure that logs are being properly truncated? Backup? I don't need no stinking Backup! Are you backing up before you perform certain key tasks such as year end close, check links, or reconciling (Inventory, AR, AP, not Bank Reconciliation)????? If not, you are playing with fire. 1-Perform these tasks first thing in the morning, then the previous nights backup will suffice. Backup! Backup! Backup! And then backup your backups. Eating right. Flossing. Exercising regularly. Vitamins. Saving for retirement. Drinking 8 glasses of water a day. Regular backups. Subject to the settings within SQL Enterprise Manager or SQL Server Management Studio, pre-posting backups are not needed with SQL 2000, 2005, or 2008. Let’s assume a common situation with a company which operates Monday through Friday, 8 AM to 5 PM. From a simplified standpoint, not covering all options for setup of a SQL database, the properties of the DYNAMICS and company databases are set to a “Full” Recovery Model. This setting is coupled with a SQL Job that runs a SQL backup overnight AND runs SQL Transaction Log Backups every two hours throughout the work day. Dynamics GP Backups. They aren't that difficult. Really. Really!! Over the last few weeks, I've worked with three clients that did not have backups of their Dynamics GP databases, let alone a backup of their modified dictionaries and customizations. This is such a common situation that whenever I work on a client's Dynamics GP system for the first time, I try and always check their backups before I begin any work. Unfortunately, when I check, I often find that they have issues with their backups. Even when a client thinks that they have backups, the backup job often isn't working properly, or there is some issue that would, or does, prevent them from recovering their data when a problem occurs. Richard pointed out this out to me yesterday. This script would backup all non-system databases on a SQL Server. You can modify it to read the company names from SY01500 and backup just the dynamics and company databases if you like. 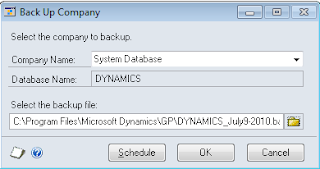 Dynamics GP 9 and 10 allow you to schedule backups from within the application. You'll need to be logged in to GP as an administrator and you'll need to be on the server. Go to File-Backup. Enter the system password if you've set one. The backup window opens, pick Schedule. 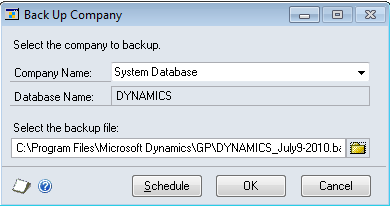 Dynamics GP Backup? I don't need no stinking Backup! I totally understand if the idea of yet another blog post about Dynamics GP SQL Server backups causes you to roll your eyes and move on to something more exciting, like watching a live video of oil constantly gushing into the ocean. But let me start with an interesting story, and then share why I'm yet again addressing this very tired subject of SQL Server backups. A few years ago, I was working with a client located in downtown Los Angeles. They are a retailer with over $100m in revenues. After implementing their Dynamics GP system, I noticed that we were running low on disk space for the SQL Server backups, and inquired about getting more space, and making sure that the backups were being copied from the server to a secondary archive location. I learned that the SQL Server backups on the local server hard drive were the only backups that we had. The files were not being copied to tape. Not to SAN. Not to removable storage. When I asked about getting the GP backups included in the enterprise backup schedule and off site backups, things got more interesting. I was told that the company effectively had no backup solution in place. At all. I was told something about interviewing new enterprise backup vendors and it was taking a long time and they hadn't yet made a decision and they weren't sure when they might have a solution, etc., etc. In disbelief (or so I thought), I spoke with a senior executive, who I'll call Ed, who headed up their internal application development. He told me a great story that was so ironic I had to redefine my definition of disbelief. Should you backup your database before processing payroll?